CSM’s new Omax 80X JetMachining Center bridge-style machine is equipped with a 50-hp pump, linear-drive motion system, Tilt-A-Jet cutting head and a 180 by 90-in. worktable with an 8-in. Z axis. Less cut-edge cleanup, the ability to edge-bevel thick plate and increased precision are just three of the reasons why the decisionmakers at CSM Mechanical, Topeka, KS, decided late in 2015 to add waterjet cutting to their shop’s equipment lineup. They did so after surveying the technology landscape at FABTECH 2015 in Chicago, seeking a cutting solution to complement the firm’s new plasma-arc-cutting (PAC) machine. Believing that the PAC machine is perfectly suited for cutting lighter-gauge ductwork fittings (1⁄2 in. thick and thinner), CSM viewed waterjet as way to expand its ability to tackle thicker work. Specifically, it wanted to improve its ability to bid on 1- to 2-in. plate work, while also being able to cut steel plate to 6 in. thick, and provide high dimensional accuracy to its customers. CSM’s customer base is just as diversified as is its fabrication shop. In addition to fabricating and installing HVAC systems (about 40 percent of its overall business), the company fabricates and installs conveyors, exhaust systems and other custom equipment for power plants, tire manufacturers, food-processing facilities and similar businesses. CSM consistently processes 3⁄4- to 1.5-in.-thick steel on the JetMachining Center. It’s also cut 2.5-in, UHMW plastic (top right) and even fiberglass floor grating on the machine, as well as tile, concrete and glass. Also shown here are 1⁄4-in.-thick floor-drain grates (above), with countersunk holes beveled on the waterjet machine using the five-axis head. 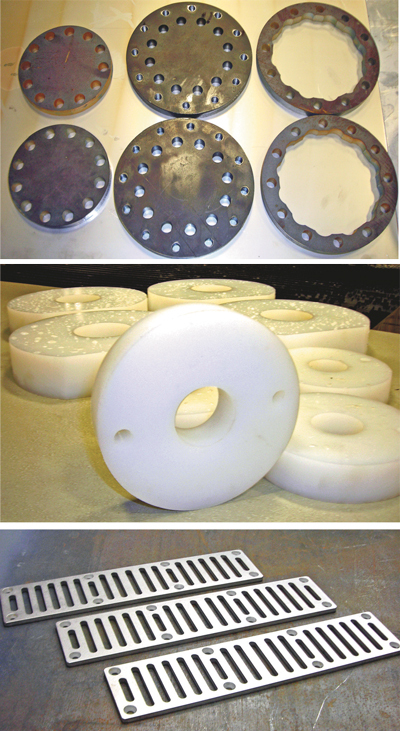 An example of such a recent project: cutting, forming and assembling a wood-pulp mixer for a Cellophane plant. 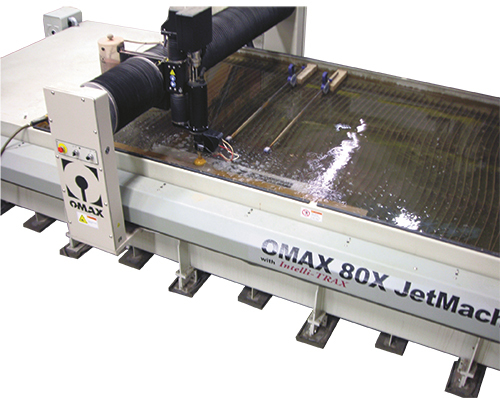 The project represents a full week’s worth of waterjet cutting, no problem for CSM’s new Omax 80X JetMachining Center bridge-style machine —equipped with 50-hp pump, linear-drive motion system, Tilt-A-Jet cutting head and a 180 by 90-in. worktable with an 8-in. Z axis. Brewer then describes a somewhat unique application for the 80X JetMachining Center: cutting 1.5-in.-thick steel plate to fabricate custom press-brake dies that CSM will use to form some of the Hastelloy into saddle brackets. The shop operates two press brakes —a 14-ft. 300-ton model, and a new 190-ton CNC model from Ermaksan. That new brake, along with the waterjet machine and the new PAC machine (from Multicam) added to the plant floor early in 2016, represent CSM’s commitment to growing its custom-fabrication business. CSM consistently processes 3⁄4- to 1.5-in.-thick material on the JetMachining Center. It’s also cut 2.5-in, UHMW plastic and even fiberglass floor grating on the machine, as well as tile, concrete and glass. While Brewer admits that there’s still some learning to do when it comes to optimizing its use of the Omax five-axis cutting head, there’s no question that the capabilities are paying off for the company. Some 30 percent of the work processed on the machine leverages its five-axis capabilities, and Brewer expects that percentage to quickly increase. 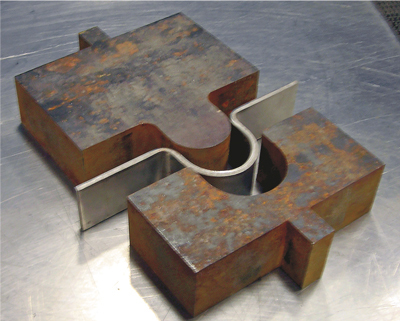 A somewhat unique application for the 80X JetMachining Center: cutting 1.5-in.-thick steel plate to fabricate custom press-brake dies that CSM uses to form Hastelloy blanks, shown, into saddle brackets. As far as continuing to grow the application of five-axis cutting, Brewer says that he continues to learn new ways to program the machine in order to better optimize its five-axis capabilities. He has, though, learned plenty in less than one year of operating the JetMachining Center. Among the most important lessons learned: developing a process to avoid cutting-head collisions resulting from wavy material, which initially led to shortened consumable life. The Omax Terrain Follower, according to Omax literature, directly attaches to the Omax A-Jet cutting head. A high-resolution magnetic encoder senses changes in material height to trigger adjustments in nozzle standoff to avoid contact with the workpiece surface and protect the nozzle and related hardware. Ideal applications are when cutting large parts on uneven or warped sheets, as sometimes is the case at CSM, as well as when cutting materials that stress-relieve and warp during cutting.